Christine Taylor VK5CTY was awarded 'The Higginbotham Award' at the May 2017 WIA Conference (Wireless Institute Australia). Award in recognition of her long history of Amateur Radio magazine contributions particularly on Women in Radio, ALARA (Australian Ladies Amateur Radio Assoc.) & AHARS News (Adelaide Hills Amateur Radio Society). The Higginbotham Award is named after Ron Higginbotham VK3RN, who produced 'Amateur Radio' magazine over many decades; 1st awarded 1964. 65 years ago on June 2, 1952 SAWRC (South African Womens Radio Club) was founded. 6 years ago June 2011 this YL group newsletter (YL.beam) was started. And we welcome new operators. The local regulatory authority ICASA has cancelled many lapsed, and in arrears licenses. This has resulted in the transfer of 50 YL's from our current data-base to “Cancelled”. A separate notification has been sent with information as to reinstatement. This months newsletter covers the Pacific Ocean; from Peru in the east, north to Hawaii and south-west to New Zealand. Hope it will demonstrate how useful Amateur Radio can be as it spans oceans, cultures, technology and time. Enjoy. Kon-Tiki's 70th Anniversary [28 april- 7 aug 1947] on August 7, 1947, the maritime mobile station LI2B concluded its journey from South America by washing ashore on an island in French Polynesia. It was better known as the Kon-Tiki, a raft constructed largely from balsa logs. 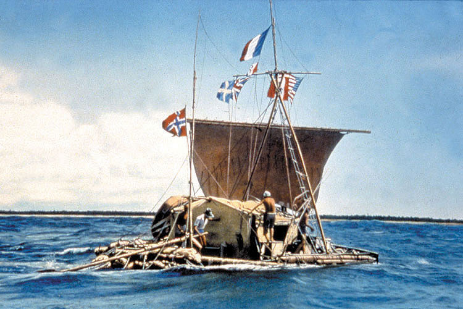 Through this expedition, Thor Heyerdahl, Norwegian explorer and ethnologist wanted to prove that it was possible for people from South America to have crossed the Pacific from east to west and settled the Polynesian islands. Heyerdahl and his team built a raft of the type preserved in Inca legends and early Spanish historical accounts. They named the expedition in honor of the pre-Inca Sun god “Kon-Tiki” and departed Peru for Polynesia on April 28, 1947. Throughout the 101-day voyage, the expedition members collected meteorological and oceano-graphic data. The raft sailed more than 4300 miles across the Pacific Ocean before smashing into a reef in the Tuamotu Islands on August 7, 1947. Thor Heyerdahl was accompanied by five crew members, including former Norwegian veteran under-ground radio operators, Knut Haugland and Torstein Raaby; neither had ham radio experience, which they took along on this ocean journey. LI2B was the amateur radio call-sign of the Kon-Tiki raft expedition. For 3 weeks following the crew’s departure from Peru, the only radio contact Kon-Tiki had was with OBE, the station of the Peruvian Naval School. LI2B kept to a schedule, trying to contact key amateur stations on specified frequencies without success. Finally, on May 20, Harold Kempel, W6EVM, heard and worked LI2B on 14.142 MHz, providing the raft with its first North American contact. By mid-June, LI2B had worked numerous amateur stations, and as the trip progressed, a long-haul network of amateur stations developed. One of the network regulars was W3YA, the Penn State Amateur Radio Club station, which helped relay traffic to the Norwegian embassy in Washington. In the final month of the voyage, the 20 meter transmitter’s crystals had all failed, so the crew re-tuned the 10 meter transmitter to 13.990 MHz, the closest they could get to 20 meters. The expedition carried three watertight radio transmitters. The first operated on the 40 and 20 meters bands, the second on 10 meters and the third on 6 meters. Each unit was made up entirely of 2E30 vacuum tubes providing 10 W of RF output. As an emergency backup, they also carried a German Mark V transceiver originally re-created by Britain's Special Operations Executive in 1942. Other equipment included a hand-cranked emergency set of the Gibson Girl type for use on the maritime bands, a special VHF set for contacting aircraft and two British Mark II transmitters. The Kon-Tiki also carried a National Radio Company NC-173 receiver. Dry batteries and a hand-cranked generator supplied the power. Post-script: Knut Magne Haugland of Norway, passed away December 25, 2009, age 92; the last survivor of the six man crew on the Kon-Tiki expedition. Kon-Tiki's 70th Aniversary celebrated with Special Event Radio Call-sign OZ44C marks Thor Heyerdahl's Kon-Tiki Expedition (LI2B/MaritimeMobile) 70 years ago. The call will be active until the end of 2017. QSL via 5P2BA, direct or via the bureau. Experimenterende Danske Radioamatører (EDR for short) was founded 15th August 1927. 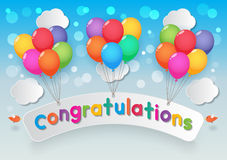 This award is conferred upon an individual radio amateur or Amateur Radio group that has demonstrated devotion to human welfare, peace, and international understanding through Amateur Radio. The League established this annual award to recognize Amateur Radio operators who have used ham radio to provide extraordinary service to others in times of crisis or disaster. The Darlings ongoing efforts over many years with on-the-air activities during weather events, including several typhoons, as well as other emergency activities, (assistance to boaters in trouble) have earned them this recognition. 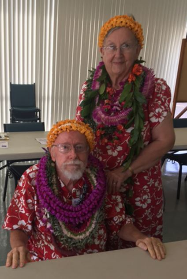 Barbara is the ARRL QSL manager for Hawaii State and very active in the Big Island ARC while Richard is one of two DXCC card checkers for the State of Hawaii with over 300 countries confirmed himself. Both have traveled extensively throughout the Pacific so are familiar with many islands along with the problems of both travel and communications. They have also provided support in the form of money and material. 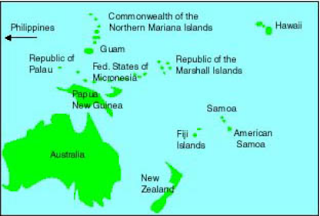 Made up of around 607 islands, covering a distance of about 1,677 miles or 2,700 km., spread across the Western Pacific Ocean, with a population of about 103,000 lies FSM (Federated States of Micronesia); consisting of four states – from west to east, Yap, Chuuk, Pohnpei and Kosrae. Towards the end of April 2015 Typhoon Maysak struck Ulithi Atoll with 160 MPH winds, with gusts up to 195 MPH. A major storm surge of unknown height also hit and infrastructure, including schools, homes, power and telecommunication systems, suffered major damage or were destroyed. HF gear was sent to FSM (Federated States of Micronesia) as part of a relief effort in the wake of Tropical Cyclone Maysak. Ham Aid equipment accompanied a shipment of radio gear, tools and supplies from Hawaii. Ham Aid kits had originally been shipped to Hawaii during the fall of 2014, as the massive Puna volcanic lava flow threatened some communities on the Big Island of Hawaii. William (V63YWR) one of the newer FSM (Federated States of Micronesia) hams that Richard regularly talks to, can get on the air now partially because of the solar panels, batteries and antennas that Richard and Barbara helped supply. The health and welfare phone patches and messages go all over the United States and the emotion involved can be heard especially since some of the people have not talked to their relatives in several years. They speak in several Micronesian languages. 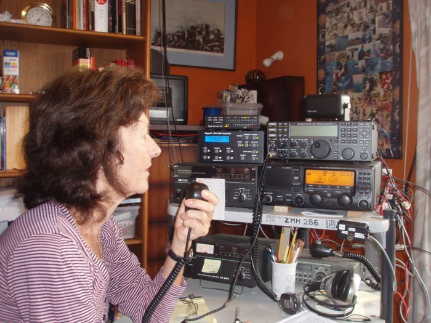 Patricia Dallas, ZL2RK, in Whangaparaoa (just north of Auckland, New Zealand) is not heard on the ham bands much but between May and December she is very busy on the radio. I was very active for the 15 or so years we cruised around the world. My husband even got his ham license when we were in Mexico. He is ZL2VY now. Among other things he has a meteorological background which proved very useful when we were cruising and he often gave weather info to fellow cruisers. When we decided to be land based in 2012 we combined our interests to give weather to friends on route from NZ to the Islands. After a visit from a radio inspector(!) we decided to get a marine coast station license and reach more people. It is amazing how quickly the news gets out about a free weather service. Gulf Harbour Radio, ZMH286 was born. In 2012, one boat called in from Wallis (north of Fiji) and asked how I organised boats. I think I had got in a muddle so it was a good question! When I replied that I just used a simple excel spread sheet, he said he could do better. Well, little did I know that his profession was interactive web sites and indeed he did do better! www.yit.nz was born in support of the radio station. (YIT – yachts in transit). It enables boats to send their positions, weather report and comments directly to the web site. My husband then checks that what he is seeing in weather models reflects the true picture and then when we start the morning ‘Patricia and David show’ I add the positions and information from those boats that don’t have on board email. Family and friends can then follow their progress and be part of the adventure. We are also called upon from time to time by RCC (Rescue Cordination Centre) when information is needed relating to a boat, or sometimes they need to find a boat. The site has mushroomed over the years and now we handle about 500 boats. This is the only service of its kind as others that used to be there, like Des Renner, Dr John etc have passed away. We operate from May 1 to November 30 as this is the time when boats leave the NZ and Australian winter behind and head for the tropics. Part way through our winter they are joined by boats coming west from Europe and North America. We now use about 500watts to make sure we are heard. David does about 30mins of weather for passage makers and those in each of the island groups; after that we take questions and comments. In 2016 we started live streaming. This was helpful for those still in NZ waiting for passage weather to go north. They are too close in Whangarei and Opua to hear us on our usual frequency of 8752kHz. We were surprised that the cost of cell phone time in places like Fiji meant that we had quite a few listeners on the streaming from there too. Often busy anchorages like Muscat Cove (Fiji) have a high noise level so that made it easier for them to hear. By the end of November we are more than ready for a rest. By then all the boats are out of the cyclone season, or should be, and we are ready to use our own boat in the Hauraki Gulf.